What Makes Egyptian Cotton so Great? People have long thought Egyptian cotton to be superior to other cottons. But if you ask most people why this is, most have no idea. So, what makes Egyptian cotton so great? Egyptian cotton is hand picked, which is gentler on the fibers. When cotton is picked by machine, the fibers may be stretched or curled. Sometimes the fibers even split when removed. The picking machine simply is not as gentle as a hand. Hand picking produces straight and whole. Another benefit of hand picking is that the worker can look to see that only the best cotton is picked. A machine picks all the cotton, regardless of quality. The human eye is a better judge as to whether the cotton should be picked or not. Unlike cotton grown in the United States, which is primarily short staple cotton, Egyptian cotton is long staple cotton. Long staple cotton is also commonly referred to as long fiber cotton. Long staple cotton has more continuous fiber to use when converting the cotton to thread or yarn. When yarn is continuous, it is stronger. Long fiber yarn is narrower in diameter yet still stronger than other types of cotton, including short staple. Narrower yarn means that more threads can be fit into the cloth per square inch. More threads per square inch means stronger fabric that is still very lightweight and can breathe well. More threads per inch in bedding mean that the thread count will be higher. A higher thread count means you are purchasing fabric that is extremely strong and will last for a very long time if you follow care proper instructions. 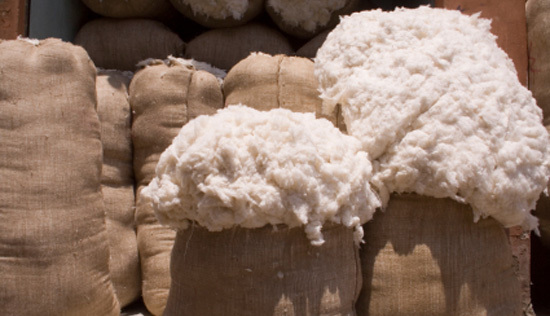 Products made from Egyptian cotton can last for years. Another reason that makes Egyptian cotton so great is that it will lint less than other cottons. This is a great characteristic for any fiber or cloth to have. It also is especially good for Egyptian cotton, as due to the thread count, Egyptian can have a long life due to its strength. It would be a shame to compromise the long lifespan of Egyptian cotton products shortened because of linting or pilling. Products made from Egyptian cotton might appear harder or stiffer than other cottons right out of the package. This is due to the strength of the fibers and is nothing to worry about. Egyptian cotton grows softer and softer with each washing, aging beautifully. Egyptian cotton is considered to be stronger, softer and more durable than other cottons. These desirable qualities are what makes Egyptian cotton so great. Egyptian cotton is typically more expensive, but tends to be worth it. Most consider Egyptian cotton to be the best cotton there is in the world. Egyptian cotton is considered a luxury, and was once hard to find, but is now much more readily available. Why Are Some T-Shirt Made From Scratchy Cotton? Can I Make It Less Scratchy? Great write-up on a question I’ve been asking myself for years. Thanks! It does feel the best on my skin.